After a lot of hard work to clear PG medical entrance exams, students have to face another hurdle after getting a good rank. That hurdle is to choose a good PG speciality branch. Nowadays after doing MD/MS, it has become almost a necessity to do DM/M.Ch as PG seats are increasing every year and so is the competition. I am enlisting here the MD/MS courses by doing which the students could get into the respective DM/M.Ch courses. Different States and institutes have different criteria on which super-speciality courses can be done by doing which MD/MS courses. 90% of these criteria are same in all institutes or states so students have to manually check their respective states of allowed super-speciality courses. More important than State and Institute rules are MCI Regulations. It mentions all details of all DM/ M. Ch courses and prerequisite MD/ MD courses for a candidate to be eligible for super specialty courses. Following are MD courses which are the prerequisite for DM courses according to MCI PG Medical Regulation 2000 (click here for pdf). Following are MS courses which are the prerequisite for M. Ch courses according to MCI PG Medical Regulation 2000 (click here for pdf). I am also mentioning here details of AIIMS and MH-SSET (Maharashtra Super-Speciality Entrance Test) as mentioned in AIIMS Jan 2015 & MH-SSET 2014 Prospectuses (Information Brochures). A Candidate must possess a degree in MD/MS or DNB from a University recognized by the MCI in the respective discipline as mentioned. One specific thing I would like to point out from AIIMS-DM /MCh / MHA / Ph.D. July 2015 Prospectus is this statement “A Candidate must possess a degree in MD/MS or DNB from a University recognized by the MCI in the respective discipline as mentioned hereunder”. So according to this, even DNB candidates are eligible for AIIMS-DM /MCh courses. and/or TB & Chest Diseases. As seen in above tables there a few differences in required qualifications for AIIMS and Maharashtra Super-Speciality courses. I have edited above tables with latest data from Maharashtra MHSSET 2016 Information Brochure. M.Ch. Surgical Oncology is no longer mentioned in MHSSET 2016 information brochure. The probable reason for this could be no more seats of that specialty being offered by any institute in Maharashtra. In AIIMS MD (Respiratory Medicine) are not allowed to do DM Cardiology. In AIIMS MD (Biochemistry) are not allowed to do DM Endocrinology. In AIIMS MD (Radiotherapy) are not allowed to do DM Medical Oncology. In AIIMS MS (Ortho) / MD (Ob. & Gy.) are not allowed to do M.Ch Surgical Oncology. In AIIMS MD (Biochemistry)/ MD (Pathology) are not allowed to do DM Clinical Haematology. So candidates are advised to choose their Speciality wisely. I am updating this article to include the list of Super Specialty Programmes with Eligible Qualification for Diplomate National Board (DNB) Super Specialty (SS) courses as mentioned in Information Bulletin for Diplomate of National Board Centralized Entrance Test – Super Specialty 2016 (DNB CETSS 2016). as a Specialist in that subject. You can go to our forum here for further discussion. Hello Sir! Thank you very much for providing this useful information. I have asked around and some students doing M.D. Microbiology at civil hospital have told me that one can’t do MD Endocrinology or MD Immunology after Md Biochemistry. Is there any other way to confirm your article sir? Please acknowledge.. Thank you very much. MCI regulations mentioned in the article are recommendations by MCI but it depend on the institute/ state eligibility criteria’s in the end. Earlier Maharashtra state used to allow MD Biochemistry candidates to be eligible for DM Endocrinology but now it has been changed to DM Clinical Haematology according to MH-SSET 2014 information brochure. You can find it here. So you have to check for latest and individual institute/ state eligibility criteria’s for Superspeciality courses. Beg your pardon , sir but u have mentioned MS(radiotherapy) is eligible to do DM medical oncology as super speciality. Is not it MD(radiation oncology)….confused. please acknowledge…..thank you. Thank you for pointing it out but the table mentioned in the text is taken directly from the MCI website where it is mentioned as MS Radiotherapy. But as per NEET SS brochures, it is MD Radiation Oncology. Sir why PGI Chandigarh doesn’t allow MD biochemistry as eligible candidate for DM Clininal Hematology when MCI allows it? This is unjust. sir, DNB cet ss eligibilty criteria says md /dnb medicine on pathology for DM clinical hematology . what does this mean? Im a MD pathology degree holder. can i apply or not? if yes then syllabus is that of general medicine, basic sciences and recent advances? PLEASE CLARIFY. other options (universities/ colleges) for dm clinical hematology after md pathology also may be guided.. other entrances too. May i know a DNB candiate elligible for writing DM enterncae.,,,,please clerify…. As per maharastyra DM enternece criteria–>”The candidate must possess recognized postgraduate degree MD/MS or its equivalent from a medical college recognized by MCI”……………….i agree DNb is equivalent bt nowhere it is being done from medical college………….here in criteria they have asked eqivalent degree from medical college……………….. Yes, it is possible to appear for DM entrance exams with DNB degree. It depends on the institute/ university criteria. No. Only MD candidates are eligible. SIR AFTER MD COMMUNITY MEDICINE, IS THERE ANY CLINICAL DM SUBJECTS THAT CAN BE DONE? According to MCI rule, any MD can do DM medical genetics. But only institute in India offering that course is SGPGMI and it only allows selected MD like Medicine and pediatrics to do it. Community medicine people cannot do DM infectious disease. In India right now there are not major career opportunities for Medical Genetics but in future is bound to play a big role and high demand. You can also open a Genetic counseling clinic which is gaining some interest of people in India. I don’t think any clinical DM courses can be done after MD Microbiology, at-least none that I know of. Sanjay Gandhi Postgraduate Institute of Medical Sciences, Lucknow is the only institute in India to offer DM Medical Genetics course. All MD doctors are eligible for that course. That way you can even do MD of any specialty by cracking AIPGMEE or any state level exam. There is no such bar that you can’t do MD/ MS after doing PG from a specialty. No. There is not age limit mentioned in AIPGMEE prospectus. Is there an age limit for dm neonatology exam? In MH SSET there is no age limit but in AIIMS Superspecialty entrance test there is age limit of 35 years for General category students. Thank You Dr Paresh Kohli for the Thread ! you can also write cet again and choose a different specialization as Dr Kohli said. Regarding Microbiology, You have multiple choices to work at a job or setup a business or superspecialize. Immunology is one field which you can pursue DM here. By work or job I mean, you are eligible to be a Fellow after MD Microbiology and Pursue Fellowship . You can also contact the institutes if you have doubts about eligibility . The link above also gives details about the prospects of medical genetics, All the Best ! Hi myself Dr SHAILESH BARPHE. Did MD pulmonary medicine want to do DM cardiology. Why only maharashtra allows MD pulmonary medicine for Dm Cardio n why not other exams??? B coz Mic rule states that MD pulmonary medicine is eligible for DM Cardio. Pls send me any links of exams where I can opt for DM Cardio with MD pulmonary Med. It is upto decision of individual institutes/ states to allow specialities for DM/ M.Ch courses. I will check if I could find any exam which allows such thing. Well eligibility criterias of MH-SSET mention that MD Biochemistry are also allowed for DM Hematology. Different States and eligibility criteria varies and they may ask under a different name : They may ask eligibility as Critical Care or Respiratory medicine or Pulmonary Medicine or Pulmology etc, You have a lucrative career ! sir i got 51.48 and i am mbc. Will i be qualified for counselling, if yes then what course will i get??????? 51.48 what and in which exam? Yes, thank you for pointing that out but it only applies to those specific exams. For example MH-SSET information brochure mentions no such thin that DNB candidates are eligible for DM/ MCh. Ok. Again Thank you for correcting me. 1st of all , i like 2 thank you 4 ur valuable reply as this thread clears many doubts. I would like 2 knw more bout DNB non-surgical courses , present scenario of DNB in regards of passing rate n scope in future.. I love teaching , taking classes ..
Kindly rply evn if my qustn seems silly bcz i dnt hv any basic info reg Dnb. hello sir..after completing md anesthesia i want to do fellowship or dm in critical care medicine..what is the procedure for applying for ccm? where is it available? what are the salary packages after doing fellowship in ccm? Application procedures are institute specific, so you have to check individual institute exam details. I have heard people earning about 1.5 lakhs per month on average with couple of years of experience. And perks from Pharma cos are extra, which makes quite a lot of earning for ICU people. Sir M doing MD anaesthesiology i wud like to pursue DM critical care and this course i in selected institutes like SGPGI,St.Johns can you tell from where to start from to prepare as m not able to know mwans whether to start for all medical subjects or only MEDICINE Mcqs is sufficient????? You have to individually check all exams Information brochures for that. I don’t have that data. Depends on the exam but AIIMS Upper Age limit is 35 years, Upper age limit is relaxable in case of SC/ST candidates by a maximum of 5 year, OBC Candidates by a maximum of 3 years and The upper age limit is not applicable to sponsored candidates. You can do MRCP if you want to practice medicine after MD phathology. Sir, I’m from Andhra pradesh, I’m doing Diploma(pumlonology) in medical college, do I have any chance to do DM Cardiology ? I’m planning to do post diploma (respiratory medicine) in DNB, after that, can I do DM cardiology ? Please give me clarity sir. Thanx in advance. I don’t know specifically whether secondary DNB candidates are allowed for DM courses. You have to ask personally to respective officials. what are the future prospectus for DM oncology? Study material for DM entrance exams are same as that of PG medical entrance exams and only difference being that DM entrance exams are comparatively easier to crack as they have difficulty level lower than MD exams. Few other reasons are also involved like residents do not get enough time to study and many people do not even give these exams. Now coming to branches, nowadays there is competition in everything. Medical Oncology is something which has high future prospects as oncology is something which is far from saturated when it comes to treatment or even development of new drugs for that matter. sir i am doing MD Medicine and this is my second year i want to prepare for my dm examinations .. kindly guide me about the study material and the upcoming branches in wchich the competition is less and practice is gud..
please guide about the future prospectus of medical oncology…. You should start reading subject-wise books which I have mentioned in a article on this site itself. There is no separate preparation strategy for DM entrance exams as questions are very much similar only difference being that exam is a bit on easier side. Yes you have to study all the UG subjects just like preparation for AIPGMEE but main weightage is of the subject of your specialty. For example in MH-SSET 100 marks weightage is for all subjects included for MBBS course and 50 marks are for respective specialties like Medicine, Paediatrics, Surgery, Pathology, Pharmacology, Biochemistry, Resp. Medicine and Anesthesia. So a Pharmacologist will get 50 marks questions from Pharmacology subject and 100 marks from all the subjects included for MBBS course. Sir what are the areas for superspecialisation after ms ophthalmology? sir i m from maharashtra i got md biochemistry in pgmcet 1st round i have option among md biochemistry ; md pharmac ; md psm ;md micro n dcp.sir i m confused which br s better to choose..kindly guide me.. If you want a totally non-clinical subject and want to work in Pharma industry then Phamac is a good option. Otherwise I would say DCP should be a choice if you have interest in Patho. thank u sir.sir s secondary dnb after dcp s difficult to pass.passing rate are low.actualy i m interested in patho but after dcp i m confused about its scope in practice.kindly give ur opinion. If you are interested in Pathology then DCP should be your option. Don’t think too much about passing rate of DNB right now. It is better to wait for couple of years to pass the subject which you like rather than doing something which you don’t like. After DCP you can get SR posts in Govt. hospitals or you can open your own patho lab if you are willing to invest. Also there are few opportunities in which DCP people also get hired in patho labs if they have enough experience. Well if dermatology is the subject of your choice and you do not have interest in any other subject then it is better to go for Diploma of Dermatology only. You can always do secondary DNB after that if you want. sir, what are the scopes after doing dnb psychiatry,,,any superspecialty after it dm or other, job prospectus and salaries at different fields? Psychiatry is one the few branches in which along with the practice of the speciality i.e. psychiatry in this case you also have to do General practice to earn good money, Unless you become a very good and famous psychiatrist. Still in India people count going to a psychiatrist as a taboo. I don’t know about the salaries in private hospitals. Doctor of Medicine (DM) (Geriatric Mental Health) at ‘King George Medical University’, Lucknow (http://www.kgmu.org/dept_geriatric.php) and DM (Child and Adolescent Psychiatry) at ‘National Institute of Mental Health and Neurosciences’ (NIMHANS), Bangalore (http://www.nimhans.kar.nic.in/cap/default.htm) for candidates of MD/DNB psychiatry. Other awaiting super-specialty psychiatry course is DM (Addiction Medicine) at ‘National Drug Dependence Treatment Centre’ of ‘All India Institute of Medical Sciences’, New Delhi and ‘Centre for Addiction Medicine’, NIMHANS, Bangalore. Their inclusion criterias do say “MD or equivalent degree” which DNB is. But I don’t know whether any DNB candidate has got admission in these institutes or not. Prepration strategy for DM entrance exams is similar to AIPGMEE only with only difference being you should concentrate more on your primary subject i.e. Pharmacology in your case. For other subjects you can go for subject wise book I have mentioned in an article on this website only. Thank you for your reply.sir can you tell me which is a better idea to join an industry or academic? I’m a bit confused..what are the scopes in both? can i get a list of MCH surgical oncology seats whole over india where i eligible for it…. My apologies. Amit Ashish is a good book for surgery. Books to read for superspeciality entrance exams are same as that of PG medical entrance exams. You can find all the lists of recommended books in the article here. About transplant anaesthesia I do not have information as none of my contacts are doing it right now. But I will try and get any information if I could. I have recently completed my MS degree in obgy….can I pursue fellowships or short courses in UK without giving any exams ??? Can we do DM oncology after DNB radiotherapy? Yes one can do DM Oncology after DNB radiotherapy. You have to check individual exam/ institute criteria to check the for the same. I don’t have a list of all such exams. Also no info on RGUHS as well. Sorry. also any link which gives good guidance for the same….. I have not gone through information brochures of other state/ institutes, so I do not know specific criterias of their respective entrance exams. I gues you have to manually check it. I don’t think any institute in India offers this course as MCI website mentions none. Sorry, no idea about future scopes in this field. Also for preparation you just have to prepare like AIPGMEE with more weightage on your subject. You can also go through respective exams Information brochures for morr details on weightage. Even I am coming across this query for the 1st time only. I don’t think anyone could stop you from doing DNB if you want to. About course duration, I have never heard of a lesser duration course for MD candidates. But you should contact NBE officials for a confirmed answer. Sir, is there any seat for DM Infectious disease.? MCI website does not mention any. If I get any information I will update it for sure. Sir I have completed my MD Pathology..I have 2 quaries..1. Are there any DM courses apart from Hematopathology? and 2. Any DNB superspeciality course following MD Pathology? DM Clinical Hematology, DM Immunology and DM Hematopathology are allowed after MD Pathology. I have completed MD Pathology…I have 2 quarries..1. Are there any DM courses apart from hematopathology? and 2. Is there any DNB superspeciality course following MD Pathology? I don’t think it is possible to do 2 courses simultaneously as you have to submit original documents for final admission. So this question does not arise at all. Are there any regulations regarding taking seat in two diff institutes? This is illegal. It is not allowed to do 2 courses at once. If caught you are liable to be prosecuted. I don’t know about the exact punishment which could be given but relly good chances that your registration will be cancelled. Sir,is it possible to pursue a second pg in another speciality after a masters in a different one. Yes you can do PG in another subject but then only PG in 2nd subject will be recognized as your qualification. Thanks Dr.paresh . but i have a doubt, my super senior has done both paediatrics & general surgery and is practising both successfully . I have got this information from the sources. I will confirm it from MCI and update the article. Not yet. It will take few more weeks. Sorry. Don’t have any info on this. Sir I m doing MD in physiology in Mumbai. is there any scope for me in doing super speciality course in sports medicine in India or aboard? In India only diploma and degree MD of sports medicine are available. In Us there are many universities offering fellowships in sports medicine. sir dm clinical hematology after md pathology is it a clinical field or lab diagnosis field for md pathologist? It is mix of lab diagnosis and clinical field. what is the scope of oncopathologist vs clinical hematologist… from which university i can pursue oncopathology dm or fellowship? Oncology is always a branch with bright future. You can check MCI website for institutes offering DM Oncopathology courses. Yes you can do it but you have to appear for AIPGMEE again. My college is start in 2011. If MCI gets seats recognized then yes. But there are chances that seats remain permitted only. These are rules by MCI. I can not justify it. Lot of useful information here, Thanks a lot! Sir, I did my MD in Pathology and followed it up with Diploma in Human Genetics and European Diploma in Molecular Cytogenetics. Currently I am interested in doing a fellowship in Medical/Clinical Genetics, but in my knowledge, there is no centre offering such a course to an MD Path. Since you have mentioned the eligibility as “MD/MS in branch”, I would like to know from you if there are any such centres. Madam, where did you do the diploma from? I have just passed me patho. No. Only MS/DNB in General Surgery doctors are allowed. You have to check individual exams criterias for that but Maharashtra Superspecility exam allows MD Biochem candidates for DM Endocrinology. No clinical DM is allowed after MD Pharmacology. You possibility is DM Medical genetics. M. Ch Surgical Oncology can be done by MS ENT doctors. I AM DOING DNB( EMERGENCY MEDICINE) SIR… AM I ELIGIBLE TO DO DNB(CARDIOLOGY) AFTER FINISHING EMERGENCY MEDICINE…???? No. Only DNB Medicine and Pediatrics candidates are allowed. Sir I have finished MD Biochemistry and now I’m preparing for DM hematology.Am I eligible for DNB Hematology too?? No. It is only for DM seats and that too in selected state like Maharashtra. Hello Sir, I m doing Md in Anaesthesiology i wud like to do DM in critical care further i wud like to know how to start preparation for it as if only 2-3 institute provide that course as SGPGi,St.johns.Is it like that all medical subjects i have to read or Only Medicine???? Well that depends on the pattern of the exam which you are giving. Usually exams have main subject of passing as half the weightage and rest from other subjects. Reading the PG entrance books are enough to crack superspecility entrance exams as well. i have completed my md emergency medicine.. am i eligible for dm pulmonary and critical care medicne ?? can some one pllzzz guide me ??? Sir… I finished MD Anaesthesia… Am I eligible to do DM pulmonary and critical care medicine? You are eligible for D.M. Critical Care Medicine. Hello sir,myself Dr.Harshit,have finished DNB ANAESTHESIOLOGY.I want to ask one thing that why are Anaesthesia people not allowed for DM in either cardiology or Nephrology.If DM cardiology is allowed after MD Respiratory Medicine,why not Anaesthesia people should be allowed for the same.Is there any specific body to whom we can write on this issue. MCI decides these things. May be you could ask them this question. No, as per MCI website no insititute offers such course. Apollo hospitals offer fellowship (FNB) in infectious disease. I AM DOING DNB(EMERGENCY MEDICINE)… WHAT ARE THE SUPERSPECIALITY COURSES CAN I DO AFTER THAT.. WHERE IS IT AVAILABLE SIR??? No. According to MCI website only Gynaecological oncology and Surgical oncology are allowed. Sir i just wnna know about foriegn fellowships in infectious diseases ..plz do upload some links. sir,what are the scopes and pay package for DM clinical Hematologists? I have not come across such kind of rule. It must be a rule by the respective institutes. Great site indeed!! Sir are u aware of institutes offering DM Pediatric Critical Care apart from AIIMS? Postgraduate Institute of Medical Education & Research, Chandigarh offers this course. M. Ch surgical Oncology and M. Ch Plastic and Reconstructive Surgery (In AIIMS) is allowed after MS ENT. Dear Dr Paresh, its indeed a great forum and you are guiding a lot of people. My name is Rahul and i have done MD in gen medicine from Bangalore, Karnataka. I belong to UP and i had done my MBBS from Maharashtra. I am planning to appear in subspeciality exams. 1. Is the DM entrance state specific? 2. If it is so, then can you please suggest me what all state exams i can write? 2. What is the acceptable maximum age to appear in DM/DNB subspeciality entrance exam? 3. Does the DNB subspecialty applicant needs to have domicile for that particular state where the “applied for” hospital is located? 4. Can you kindly suggest me a site which gives a comprehensive list of all the hospitals offering DM/DNB in medicine subspecialities? 1. I don’t know about all of them, but as far as I know, any state person can appear for it. 2. You have to check individual state super specialty exam eligibility for that. 3. There is no official maximum age but AIIMS has this 35 years maximum age for open category students. 4. List of DM courses can be found on MCI website here. Thank you very much Dr Koli. Regards. Fellowship courses in mumbai after MD anesthesia? Sir, what options do I have after doing MD Biochemistry? In Maharashtra MD Biochemistry doctors are allowed to do DM Clinical Haematology course. DM Medical Genetics can be done after doing any MD. hello sir,i have completed M.D. pediatrics..now want to do DM or fellowship in pediatric nephrology..can u provide list of colleges??? Sir , I belong to an health portal, so in that case I need your help. please provide me all the name /eligibility/duration of the courses available in INDIA. All these details which you will provide me , will be published by your name only. Dear Dr Koli, I have gathered that their is no age criteria in all india DM entrance examination (except AIIMS), especially with respect to Uttar Pradesh. Can you kindly confirm the same please. Regards. Hello sir…a marvellous effort indeed to spare so much of your valuable time and solving others queries.Best wishes for you…. I want to know whether like DM enterance exams,fellowship enterance exams like FNB also ask questions on all the UG subjects. As far as I know NBE FET does not ask questions on other subjects. Even their information brochure mentions no such thing. Please tell the course with institute name running fellowship/DM/ Phd course run in India after Completion of MD (Physiology). What is the scope of DA + IDCCM course.How much I can expect to earn after completion of IDCCM. Or is there some other good fellowsip that are better recognized pan india except mci post DA. IDCCM is a very common course done after DA and earning potential is very high in it. From my friends I had come to know that people in ICUs earn minimum 1 lakh per month and even going more than 2 lakhs per month over a period of time. Yes you could as long as you do not have any bond issue in your present state. Yes, you can do both adult and pediatric courses as long as it is allowed by the institute. Yes, as of now no such course is offered by any institute as per MCI website. Sir, after MD Physiology is it possible to go abroad for further research?will the md degree be recognized ? You have to inquire about individual courses like Ph.D. to know about the eligibility criterias. Sports Physiology is something you can look into. I cannot comment about what will happen in the future, but these rules are unlikely to change. If you wish you can pursue 6 yrs DNB Neuro after ENT. sir heylo…am preparing for my pg entrance…i qualified AIIMS exam this novemnber. i may get ophthalmology in aiims. but am intersted in neurosurgery. can i do neurosurgery after ms opthal? No you cannot. Only MS General Surgery are allowed to do M. Ch Neurosurgery. what about surgical oncolgy after specialising ophthal? can i do MD GENERAL MEDICINE after completeing MS OPTHALMOLOGY?im doing MS OPTHALMOLOGY now.after completing MS im planning to give entrance test and if i clear can i take MD MEDICINE?is it allowed? sir am preparing for my pg entrance. i qualified this november AIIMS. i may get ophthalmology.. but am intersted in neurosurgery. can i do neurosurgery after specialising in opthal? hello sir i m 41 yrs old and md in general medicine can i do superspecialization and what courses can i do? Hi, You can do almost all DM courses with an MC Medicine degree. All the courses allowed are mentioned in this article. Also only AIIMS has age limit for DM entrance exams as far as I know. So you can give state level and other institutes DM entrance exams. No, there is no DM or DNB super speciality course allowed after DNB Emergency medicine. IS IT ALLOWED TO DO MD MEDICINE AFTER COMPLETING MS IN GENENERAL SURGERY?IS DUAL DEGREE ALLOWED IN INDIA? Yes it is allowed. I have filed an RTI regarding this query, I will update the article as soon as I get the reply from MCI. If you are able to crack the entrance exams again then you are allowed to do 2nd MD degree as well. Good morning sir. Your suggestions are giving hopes to medicos who worked hard to get through MBBS and MD. Sir I am radiologist (MD,DNB) and interested in general medicine. Can I practice both in future. I already have MD registration in up state, DNB RD registration in Mci. MD medicine will be another additional registration. Does MCI has any guidelines or file RTI to know the fact. Need your help. Please provide any link. I have already filed an RTI for this question. I will update as soon as I get a reply. Information from all the RTI I have filed has been added to the article. sir,do u have any article supporting double MD admission in india..
My kind appreciation for your activities. If a doctor can do better services knowing complementary subjects with his/ her merits, Its a two way advantage for doctor and patients. It should be allowed by MCI. sir, thnx for sharing the information and guiding everyone….ms ent people are eligible for mch neurosurgery in AIIMS. my query is….do u have any idea about whats the process of making a post graduate degree eligible for super-speciality exams…i mean….is it some kind of decision taken by the mci in isolation or are the candidates(ent in above case or pulmonary med pgs being eligible for cardiology) allowed to make a submission. It is a decision made by MCI only. Students have no role to plat in it. Sir first of all i would like to congradulate you as well as thank u for creating such a huge forum for all d medicos to discuss and clear our doubts. thank u sir. SIR thank u so much for creating such a huge discussion forum. sir i did my MD Anatomy , i want to know whT re the DM courses which i can do?and where? is der any fellowship courses which i can do to enter into the clinical side? DM in Medical Genetics can be done after any MD course, so MD Anatomy person can do it. I have not heard of any fellowship courses after MD Anatomy. Sir what to do after ms ortho? And what are the earnings of an orthopaedic surgeon? Most of the people do fellowships after doing MS Orthopedics. Earning varies, I have seen starting package of poeple from Rs. 50000 and it increases as your experience grows. After this sky is the limit depending on your skills. What are the types of fellowships? Also how much is the earning per surgery? Is it combined with the salary or is the doctor’s fee per salary given separately? A doctor can either be salaried or can be paid depending on the number of patients seen or operated. It all depends on the hospital/ clinic you are tieing up with. Earning per surgery can go as low as Rs. 2000/ surgery as far as I have heard. As there is too much competition in the healthcare sector nowadays, some surgeons are ready to do surgeries for very less. Upper limit can go in lakhs depending on the type of surgery, hospital and your skills. Sir , i wanted to know whether i can do degree after diploma Anaesthesiology ? Can we re-appear in Aipg exams after finishing diploma and take up a degree seat in other speciality like surgery or medicine ? sir you have mentioned that md path is not eligible for dnb hemat but in dnb 2015 information bulletin md path is eligible for dnb hemat…kindly clarify this thing sir and regarding syllabus of dnb cet ss medical grp it is basic applied sciences and medicine..so a pathologist should prepare in medicine rather than pathology for the entrance? If DNB information bulletin says MD pathology is eligible for DNB Hematology then they are eligible. Regarding the syllabus I guess only NBE can clarify about it. As per the Mci regulations regarding second MD I got the answer of rti filed regarding the query from Mci. It is that one can be specialist in 2 subjects and practice both. I would like to know that after completing MD psychiatry in India, what are the fellowships available abroad ? For eg. If I would like to do child or geriatric psychiatry fellowship at US, then what is the way for it. How to apply for it ? What is the procedure to be done ? Is it allowed for Indians to do fellowship or some kind of entrance exams like MLE has to be given? As of now only DM Medical genetics can be done after any MD. There is no other DM course which can be done after transfusion medicine. Really great and meaningful thread..
HELLO KOLI SIR…..THANKS for all info…. You can find all the details on the website http://www.aiimsexams.org/. You can also have a look at prospectus for January 2016 session exam. I have done my mbbs and was trying for a pg seat.But even after 3 repeats my score is not good enough. I have decided to pursue a course in MD patho or MD biochem. But i want to know about job prospects after these. And also what clinical courses can i take after doing MD in either of them. After MD Biochemistry, DM in Clinical Hematology is allowed in some states like Maharashtra. Depends on the exam but the major portion is from the specialty of yours i.e. Medicine and minor from other subjects. Refer information brochures of respective exams for the details. There is no super specialty course after MS Ophthalmology. For fellowships you have to check respective institutes websites. Yes, you can. But if you are planning to leave the seat if you are getting a seat in next year counseling, make sure you enquire about the bond in the state you are taking admission in. sir, after taking pg seat through AIPGMEE, can i give AIPGMEE exam again while doing pg? Yes you can apply as long as the course is recognized by MCI. sir, plz help, I hv taken MD forensic in jan 2016 in PGI, but in all india my rank is 10096, via which I could get DA from MP, Im 2012 mbbs paas out ,cant study anymore fr all india ….. should I stay with FM or change to DA….???? Totally depends on your interest but I personally think DA has a much wider scope and earning potential compared to Forensic Medicine. If I was in your place, I would have taken DA. Does any university allows to pursue DM neurology or any other DM courses other than neuroradiology after MD in Radiology.. I was interested in clinical subject sply Medicine or peds but stuked up with radiology residency.. I have never heard of any such course being offered after Radiology. Shehbaz and donald matthew…. i am a radiologist, 3 years post MD. I also feel the same. I also want to give PG entrance once again. I am earning quite a lot as compared to my other friends but somehow i feel i would be better off with a clinical subject. If you are still studying, just leave MD radiology. you wont have any regrets, i assure you. You would have been a topper like me and so you could easily clear AIPGMEE once again. For me though, i feel its too late. This is my mail ID: pavelmania2004@gmail.com. Sir after dnb peadiatrics …..am I eligible to write DM NEONATALOGY in AIIMS PGI AND TAMILNADU? You don’t have to surrender your degree. You can practice both subjects afterward. You can check out the previous year allotment lists with your general cat rank as reserved category respective ranks are close every year. You will get an idea about which seat will be possible for you. Mean sir i can continue my job as asst proff in med college after my clinical md/diploma nd eligible for separately practice of clinical side after my college time 9am-5pm.state council registered me in another speciality? ?without cancel my prior reg. ?….WHEN a candidate fill th form f aipgmee wt mean of column that you have already pg in any md/ms if yes then you fill further detail…. No, you have to leave your present post of Assistant professor to work as a resident doctor in any institute. You cannot do both simultaneously. After finishing your 2nd PG you can choose to do whatever you want to do. sir, is DNB Family Medicine eligible for further DM? No. Do DM is allowed after DNB family medicine. For that matter no DNB super specialty courses are allowed after the same. You can get Ophthalmology, Gen. Surgery, DCH, Anaesthesia, DCH, ObGy etc. With MD Radiotherapy you can for DM Oncology which has very bright future. In Anaesthesia, there are new fellowships which are coming. I think you should choose one based on your liking. It does not matter in what subject you have done your PG, your super speciality course content will remain the same. Sir i want to ask that will i be eligible to take DM courses if i do DNB Medicine?? Yes, DNB courses are equivalent to MD courses. Do Dnb really equivalent to MD in current scenario , with regards of getting job in govt hospitals ? Promotion scope for DNB candidate in Govt institute ?? Do Dnb graduate eligible 4 DM/Mch just aft completng his Course or shd hv sme wrk exp. ?? DNB candidates are supposed to do 1-year residency in Govt hospitals to be eligible for faculty jobs in govt medical colleges. I don’t know the specific criteria’s for promotions. And yes, DNB graduates are eligible for DM/ M Ch courses. Hello Sir…. I would like to know if there Is any case is going on for MD pulmonology…. As to remove DM CARDIOLOGY … To the list of MD pulmonology….. And Sir are there any chances of removing cardiology for MD pulmonology like endocrinology has been removed for MD biochemistry. That is in the hand of MCI. Only they could answer it. If you are opening a private lab then DCP has highest earning potential. Otherwise Pharmacology has high potential over a period of time if you do good in private companies. I don’t have information about fellowships. Do not think about money too much. Take branch of your liking. sir can a person registered in state medical council in second MD without cancellation of prior MD regisr. may pursue dual reg in same state med council,nd eligible for practice in both speciality seprately. Depends on your interest and where the permitted seat is located. If the location is in such college that it has less chances of recognition better go for Anaesthesia. WHAT IS THE FUTURE OF M.S. ENT IN INDIA? I have not heard much about the future prospects of it. can md pulmonary medicine/ tb and respiratory disease can appear for dm cardio? can md pulmonary medicine / tb and respiratory disease can appear for dnb cardio? Only those qualifications which I have mentioned in the DNB table are eligible. Yes, any MD/MS can appear for AIPGMEE and do another MD/MS. i dont think that md degree candiddate can appear in NEET/aIPGMEE again ,to get md medicine in some other deapartment. There is specific table only for Maharashtra. can md pulmonary medicine can appear for dm cardio? wat is better md pulmonary medicine in recognised seat or md medicine / pediatrics in permitted seat + bond of 5- 10 yrs? If you are capable of cracking entrance exams again, you can do any clinical course you want. But remember that in states like Maharashtra there is bond of Rs. 20 lakhs for those who leave the seat after last date. sir after MD in RESPIRATORY there is course of DM CARDIOLOGY..
is it advisable to do MD RESPIRATORY MEDICINE and than DM CARDIOLOGY?? There are only few states like Maharashtra which allow DM Cardiology after MD Respiratory medicine. I don’t know how many do. So chances are that way less. Also doing DM is your choice. You can go for it after any course if you like. 1.SIR, CAN SOME ONE DO MD/MD COURSE IN A SEPARATE CLINICAL SUBJECT AFTER DOING MD/MS IN SOME OTHER SUBJECT IN THE SAME UNIVERSITY FROM WHERE HE HAS COMPLETED HIS FIRST MD/MS DEGREE?IF NOT, THEN WHAT ARE THE UNIVERSITY IN INDIA WHICH DONOT ALLOW A PERSON TO DO SECOND MD/MS DEGREE IN THE SAME UNIVERSITY IF HE HAS COMPLETED HIS FIRST MD/MS DEGREE FROM THAT UNIVERSITY? 2. SIR DO U HAVE THE RTI REPLY FROM THE MCI U FILED EARLIER ON INFORMATION ON PERSUING DUAL DEGREE ?CAN U PLZ UPLOAD IT HERE SIR FR THE BENEFIT OF THE COMMUNITY? Yes you can have dual degree from any university. Reply for RTI was that there is no such rule that you cannot have dual degree in MCI PG Medical regulations. So it is allowed. Sorry I don’t have such kind of list. sir what clinical dm courses or clinical fellowship courses that can be done after md community medicine? No DM courses can be done. I have not heard of any fellowship after PSM. Further studies in Epidemiology can be done. I guess some institutes offer it as even three year course. I don’t remember any DM Hematological Oncology course being offered anywhere. Hyderabad . Any fellowship courses available after that? and which DNB course is better post MD, DNB HEMAT or DNB IMMUNOLOGY? Sorry, I don’t know about it. i am genuinely interested in MD general medicine or paeds..i am also confused if i should wait for another 6months and try my luck at nov central exams or should i take pulmonology…kindly help..
All the DM courses allowed after MD Pulmonology have been mentioned here. I don’t know about Andhra but if it has a separate entrance exam for DM courses you can have a look at its information brochure to know which courses are allowed after which MD. Regarding taking Medicine, if you are opening your own clinic then I think you can take Pulmonary medicine and then do the practice. Taking seat or not depends on your liking. If you are comfortable with Pulmonary medicine then take it, and if you are confident that you can crack the exam again and want MD medicine only then wait. are any of fcps/cps courses recognised by mci? ive come across some senior doctors who have done secondary dnb, md, after doing cps? is it still possible? If it is mentioned on the MCI website as seen in the link you provided, it is recognized by MCI. Secondary DNB is not allowed after CPS as far as I know. sir I have seen the previous questions and your rplies regarding the 2nd Degree but what about the courses like diploma or DNB? If some one did his MD in a suject and have a NEET rank then is he allowed to take a diploma in his choicable subject of take a DNB seat? are fcps/cps courses MCI recognised? can secondary MD, DNB be done after cps? sir have seen those previous question and your replies regarding the 2nd PG degree courses but what about the diploma or DNB? If someone did his MD in a subject and have a rank in NEET then is he allowed to take even diploma in his choicable subject or persue a DNB course in a different subject? Yes you can do a diploma or DNB in any subject, There is no such rule to not allow it. No DM course is allowed as of now. Sir..can you please mention whether there are differences in the job and salary prospects between dm oncology and dnb oncology in india ? Salary depends on your skills and hard work. You cannot compare both. As long as you are a good doctor, it does not matter whether you have DM or DNB. Sir, I have a question. Please Can You tell, how to enter directly into M.Ch. for Plastic Surgery ? I have heard that there are some fields in which we can directly do M.Ch. (6 yrs.) and Plastic Surgery is one of them. Which exams we need to give for it, if we want an M.Ch. seat in Delhi or Mumbai ? Are the PG Exams for M.S. and M.Ch. same ? Is the Course of the PG Exams same ? AIIMS offers 6 years M. Ch courses but July 2016 exam prospectus does not mention Plastic surgery course being offered. You can check out http://www.mciindia.org/InformationDesk/CollegesCoursesSearch.aspx?N=11 for list of colleges offering such courses. sir can i pursue MCH plastics post md dermatology? Sir, what are the benefits of doing DNB FNB fellowship program. I have done MD biochemistry. Sorry, I have no contact who has done that course or I have not even heard of anyone doing it. So cannot comment about it. Sir, what are the benefits of doing DNB FNB fellowship program in laboratory medicine . I have done MD biochemistry. Sorry, I don’t know about any such courses. i want to file a RTI aganist natboard for knowing whether MD/DNB radiotherapy can write dnb ss exam this year..(for super specialty medical oncology ). You can do the same via RTI online website. But I don’t think NBE comes under RTI. Maybe you can file an RTI directly to MCI or Ministry of Health, but I am doubtful whether that will be helpful. Hello sir, can i appear in DM/DNB cardio exam after MRCP? Only MD or equivalent degree holder can appear for these exams. A. Govt. Institutes for pursuing MCh Plastic Surgery post M.S. (E.N.T.). B. Any special comments regarding Preparation for the Entrance Exams of these respective Institutes, like details to score well in the theory of the respective institute’s entrance exams. To share with you I came across 2 Institutes: these are AIIMS, New Delhi and PGI, Chandigarh. It would be grateful of you, if you address and Add any other. Sorry, I do not have a list of institutes allowing MCh after ENT. Preparation is similar to PG entrance exams with more focus on the subject of the speciality. (To share my knowledge i am aware of only 2 institutes: AIIMS, Delhi and PGI, Chandigarh). B. any special comment on MCQ Preparation for respective Institute’s ‘Question’ Pattern. C. Does the MCQ Paper, and hence the preparation, differ for Eligible Candidates from different specialties i.e. Gen. Surgery, E.N.T., Orthopedics (as these are the specialties eligible for AIIMS and PGI)? sir, is super specialization possible after DNB family medicine? when are you starting much. in Gynae oncosurgery.when&how can I apply for it? Sir, what super specialization is possible after MD/DNB Emergency medicine? Is it possible to do DM cardio after emergency medicine?? Sir, I am pursuing DNB in pulmonology.. Want to know where all do I have option of doing DM pulmonology and critical care in India..
Have any oppotunity for fellowship at AIIMS in pediatrics neurology, for foreign fellows. You have to go through the information brochure to see the eligibility criteria’s. other options (universities/ colleges) for dm clinical hematology after md pathology also may be guided.. other entrances. Maharashtra state allows DM Clinical Hematology after MD Pathology. And yes even DNB SS of Hematology can be done after MD Pathology. I do not know in details about the exam pattern. It is better to check the information brochure of respective exams. im not sure if this is getting posted to you sir. I have seen and replied to your comment. Scope of MD in sports medicine in india or abroad. i have competed diploma in cinical pathology. what can I do now? i am not interested in doing MD pathology. am i eigible for superspeciaities ? how about doing PhD ?? You cannot do any super specialty course. PhD can be done. Very good scope. Getting hired in ICU becomes easier and it has lot of money. But that comes along with high pressure on the job. Sir scope of M.D Sports medicine in india or abroad. Hello sir, I am MD Microbiology and i am currently employed as an Assistant professor. I want a guidance as to take which path. What DM or PDCC or fellowship courses I can go for? Can I give FRCP? What is its benefit? If I want to go abroad to US or Canada how is it possible. Kindly help. what are the opportunity of surgical oncology in india?where we can get job?average salary? Sorry, I have not read any recent marks distribution and syllabus. Hello sir, kindly inform,1.fees of dm course in government medical college after md medicine & stipend of dm course in government medical colleges 2.is there bond after dm course? Fees, bond and stipend depends on the institute and state. Hello sir, I have done MD Microbiology. Am I eligible for DM immunology? Hello sir, I have done MD Microbiology.Am i eligible for DM Immunology? In AIIMS, MD Microbiology are allowed to do DM Infectious Diseases. As of current admission requirements, what are the d possibilities after MD emergency medicine?? Thanks sir! No DM course can be done after MD Emergency medicine. Physiology deals with all functions of the body. But only immunology and medical genetic is offer as super specialties. Don’t you think sir there should be more to offer. Or are there in other countries. There is nothing anyone but MCI can do about it. Sir can you please give me a list of medical colleges offering sponsored superspecialisation courses in India. Sorry, I have no such list. Sir, as a student of Maharashtra bonded by 1 year UG bond, if I take DNB Medicine now, then after completing DNB I will have to complete bond as a JR or SR? That depends on the post you are joining. As per latest reports there will be NEET SS on 10th June 2017,is there any age limit for super speciality courses like D.M.and Mch in India at present? In general, there is no age limit but institutes like AIIMS puts age limit of 35 years. You have to go through information brochures of the exams to know the same. I have completed M.Sc. in Microbiology. What course should i do if i want to pursue further in Dermatology or Hematology..
You have to have a MBBS degree for doing MD any any specialty. Thankyou Sir.. what are the best options I have in medical field after MSc in Microbiology.. It is all about the entrance exam you clear for DM. So Pediatrics or Medicine would not matter. MS ENT post graduate eligible for mch plastic surgery???? Sir , aftet dnb emergency medicine , can i give exam for super speciality cardiology?? What are the future of emergency medicine in india? No, you can’t. Future is good as this is an evergreen branch. Helo sir i want to become a neurologist professor . But i want to do my md on non clinic subject that i cn study at night so which subject will give to me chance to do dm on neurologist and then i will get chance to research about brain function. You cannot do DM Neurology after doing MD in Non-clinical subject. What is the scope of emergency medicine in india? can i do any DM course after doing emergency medicine? You can do DM Clinical Haematology after MD Biochem according to NEET-SS 2017. Sir Can I pursue my DM in Neuro while practising at my clinic. As a resident doctor, you have to be present all the time. But if your HOD allows, you might be able to work. Sir,I m doing MD psychiatry, and want to do DM neurology , but it seems that there is no such provisions of doing dm neurology after md psychiatry, what can I do ? as far as i know after MD Psychiarty.one can do DM in addiction n DM in adolescent mental health n DM geriatric mental health…also u can do fellowship in sleep disorders..
but m not very sure …..
so have asked the same question…..
hopefully Koli sir would reply to our queries. You can do D.M. Clinical Haematology after MD/DNB (Biochemistry). 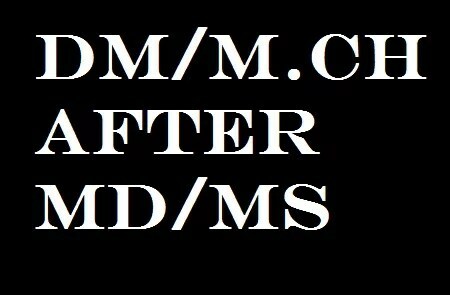 What other DM can be done after MD Biochemistry? Only DM Clinical Haematology is allowed according to NEET-SS 2017 information brochure. what all courses DM courses r there after MD Psychiarty sir? is it lucrative in India?? D.M. Child & Adolescent Psychiatry. Regarding it being lucrative, you can ask Psychiatrist. NEET-SS information brochure says MD /DNB (Paediatrics) candidates can do DM Endocrinology. Is it still allowed to pursue 2 MDs in India? I am currently pursuing MD-Dermatology and would like to pursue MD-General Medicine next. Is that possible? Are there any regulations that can prevent me from doing so? There are no regulations which prevent you from doing so. HELO SIR I AM MBBS GRADUATE.CAN I DO MD OR DM IN PSYCOLOGY? There is no such course as DM Psychology. Hi sir.. I am pursuing MD PSM currently and i am willing to upgrade in future to clinical Sub.. Can i do MD/DNB in pediatrics aftr completion..? Sir plz tell me, does any clg favour internal specialty seat after doing pg from that clg like VMMC. Sir, please help me with option of DM reproductive medicine seats. I have completed my M.S Obs Gynae from Delhi university college. Sorry, I don’t have much information about that. Sir is it possible to give DM exam post MRCP in India? Sir can dnb nuclear medicine can go for dm onco medicine? Sir can i do dm clinical haematology after md patho?